Is My Winning System SCAM or legit? Well, today we will find out in this detailed My Winning System review. According to the alleged owner, the system is an automated trading robot designed and coded to track down the current global market statistic and produce a reliable trading signal that ensures the maximum trading win, as well as huge profit. But, before you trust on any hoax or loophole misleading information provided by scammers, standing on the facts that shows some real evidence is vital. My Winning System on other words is a unique one. 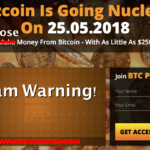 It comes with a lot more stuff that can’t be seen in any other standard scam software. It has a much of stuff that can convince you to trust on it. But, it also has the downside that helped me to figure out its clear scam attempt. So, check out the below-mentioned factors to know, why I have considered My Winning System as a Scam. Let’s start with the man himself who claims to be the owner of this system. Well, throughout the entire video pitch, the only thing we can encounter is the voice over the act and yes there is a still image seen on the website with a smile on face. However, there is no real person of blood and bones was seen during the entire video presentation. Neither a bit of chance to know his true identity or profession. As the video continues, the man keep explains how he used to be a victim of many scam attempts. His story continues, and he claims, somehow he cracked the code of binary options trading tactics that many Wall Street Big cats execute to make millions of dollars. However, how and where he got the programming script of the system remains secret. I was thinking, any one can make bold statements. So, what is the evidence that could drive my mind to trust this guy? Trading in binary options is not something we do playfully. We convince to put our hard-earned money into the trade so that we can earn a pretty fair amount in terms of profit. You can’t simply trust someone claiming to make you million of dollars in months, staying behind the bars that you can’t even see his real face. Well, neither you can be 100% sure about his deception unless you get a proper evidence. So here is it. From the above screenshot image, you can quickly clarify that image seen in the website, is just a purchased (or stealth) stock photo from some other site called dreamstime.com. This is a strong proof that the man who’s hiding behind the bars is a phony scam artist and the entire software is a 100% scam. Well, the presenter did his best to prove that he is real, his system is legitimate, and he is making a huge amount of money from his system called My Winning System. He tried his best to show us how convenient his system in trading accurately with 70% to 80% winning rate. He showcased the entire trading session manually. 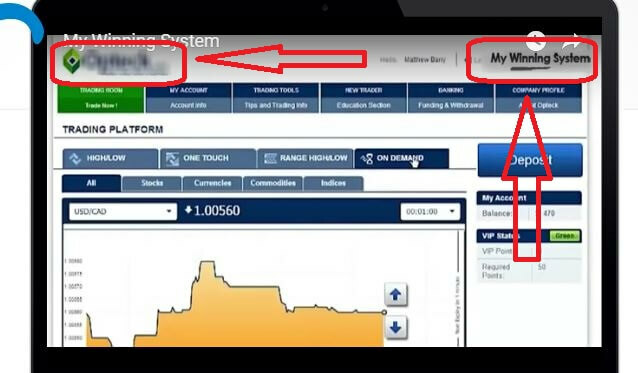 But, you must notice that he was actually showing the live trading session that was done using some other software. The real footage of trading session was edited and the name of the original system was blurred (located at the top left corner), and the title of My Winning System is poorly attached to the upper-right corner. Check out the below image to feed your curiosity. From the above screenshot image, it is clear that the video footage was all edited and fabricated to show us as the My Winning System really works. But, the pathetic editing of the video ruined the entire effort of the scammer. Oh yes, I forgot to mention that the person behind this scam attempt introduces Himself as Matthew Pears. Not in the promo video, you will hear him mentioning his name, but only on the webpage, it was shown in tiny letters. Nevertheless, that’s not the issue. But the dramatical scam attempt smelled when he integrated some pay cheque in term of the evidence of his true earning from this system and financial status. The case is that, in the homepage of the official website, his name was visibly written as Matthew Pears. Now, let’s have a closer look at the pay cheque he provided. In one of the fabricated pay cheques, the name of the payee was written as Matthew Barry. This can’t be possible that a person possesses two different surnames unless the names are made up or fake. Ball at your court, do you believe this guy? I don’t, and I am 110% confident that even the shown pay cheques are also edited and fake. Mind to check out the mentioned date on one of the cheques and the fake seals. How could two different banks possibly use the same seal to verify their cheque payments? You will certainly burst out in laughter. 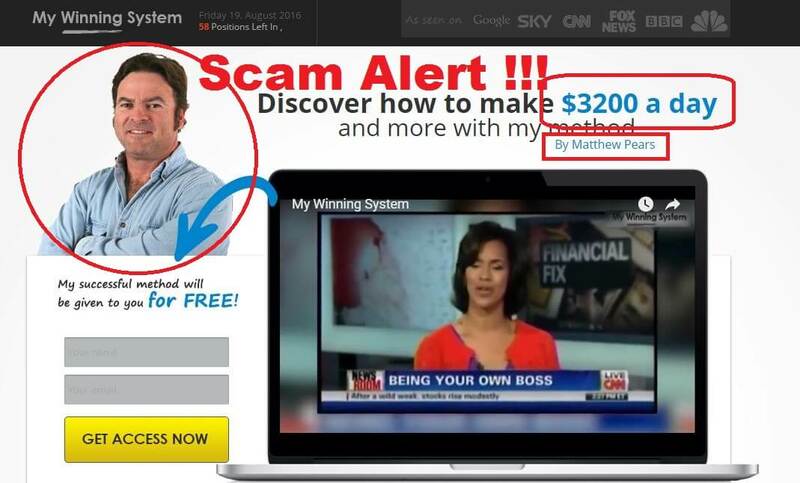 Let’s take a look at the earning profit from this hilarious scam software known as My Winning System; wow! it’s $3200 a day! Well, during the presentation video, Mr. Matthew Fake claimed that he had earned over a couple of millions within the first 6 months using his revolutionary software. I am wondering, being such wealthy person, he could not effort to make his website a little considerable? During The Promo video, the presenter shouted several times that this system is absolutely free of cost. But, this is not the actual case. 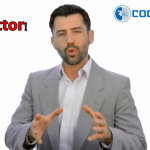 The so-called authorized Binary Options Broker he as asking you to trade with is more likely to be a scam as well. There is no evidence broker regulation or license. So, this is very much expected that the associated brokers are also scam and there will be no return of investment once you deposited the initial amount to the brokerage service. Join Best Binary Options Trading Software instead! After the complete analyzation and examination, there should not be any doubt that the so called money making software is a Scam. So if you wish to save your money from any scam, then you should never ever think to invest in this My Winning System software.